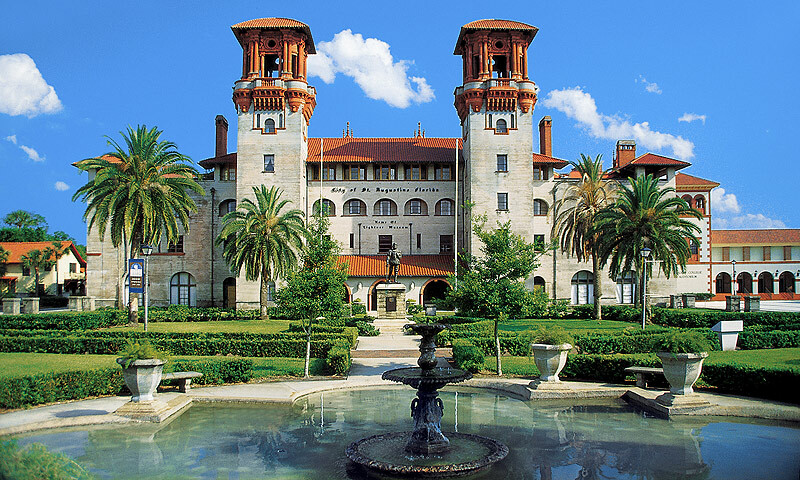 Amore Wedding Chapel in historic downtown Saint Augustine sits in the beautiful Lightner Museum built by Henry Flagler in 1888. Amore Wedding Chapel offers beautiful seating inside, to match the majesty and intricacy of the magnificent Lightner Building! This romantic setting is added to by the Spanish Renaissance style of the building and the lush tropical gardens surrounding the museum. This is not just a wedding chapel too. The professionals at Amore have been planning and helping out in every aspect of the weddings for years and enjoy every minute of it! From your invitations, to your minister, to your cake, Amore can assist you. They also offer professional wedding photographers, florists and even can arrange a beautiful horse drawn carriage ride after the services! Enjoy your magical day at Amore Wedding Chapel in the Lightner Museum in the heart of romantic and enchanting downtown St. Augustine. Amore Wedding Chapel is experienced in every facet of wedding planning so let these experts help you create a perfect day! Call Amore Wedding Chapel today for more information, and to book your exciting day and enjoy the lush history and beauty that the setting of the Lightner Building affords you. We had a small wedding with just our family. It was perfect. I couldn't have asked for a more intimate wedding. From the vows all the way to ringing the bell, my husband and I were so happy with the chapel and the wedding. We want to return for the baptism of our son!